A Millennium Forest was planted in 2000 on the grounds of the Vineland Research & Innovation Centre as a project of the Lincoln Horticultural Society and the Rotary Club of Beamsville in cooperation with the University of Guelph. This Carolinian forest contains over 100 varieties of trees which were purchased by local community group, families and businesses. There is a lovely path winding it's way amongst the trees and benches placed along the way to sit and relax and admire the sights. Beamsville Women's Institute chose the Hawthorn Crimson Cloud to be planted "For Home and Country". 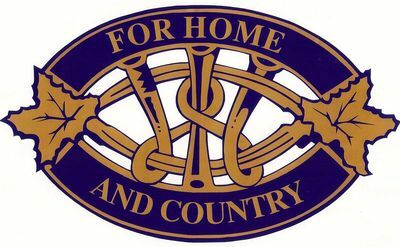 Beamsville Women's Institute was approached by Mayor Ray Konkle in 1999 to gather all the memorabilia for the Town's Time Capsule that was to be placed in the Millennium Forest to be opened in 2050. Hundreds of items were collected from local residents, businesses and community groups and placed in the capsule which was buried in 2001. The WI was pleased to be part of this historical event! 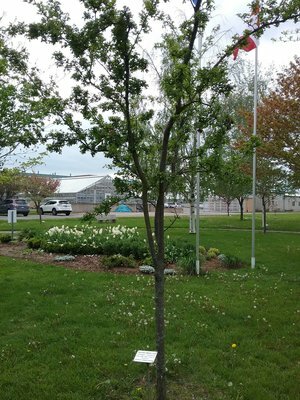 Beamsville Women's Institute chose to have a Hawthorn Crimson Cloud tree planted in the Millennium Forest in 2000 on the grounds of the Vineland Research & Innovation Centre as a project of the Lincoln Horticultural Society and the Rotary Club of Beamsville in cooperation with the University of Guelph. This Carolinian Forest contains over 100 varieties of trees which were purchased by local community groups, families and businesses. There is a meandering path with benches placed along the way so visitors can rest and admire the sights. The Millennium Forest is also the sight of the Time Capsule which was buried in 2001. Beamsville Women's Institute were asked by then Mayor Ray Konkle to gather the memorabilia from local residents, community groups and businesses to be placed in the time capsule. 2050 will see the unveiling of the contents -- our grandchildren better be there to see what we put in it! !